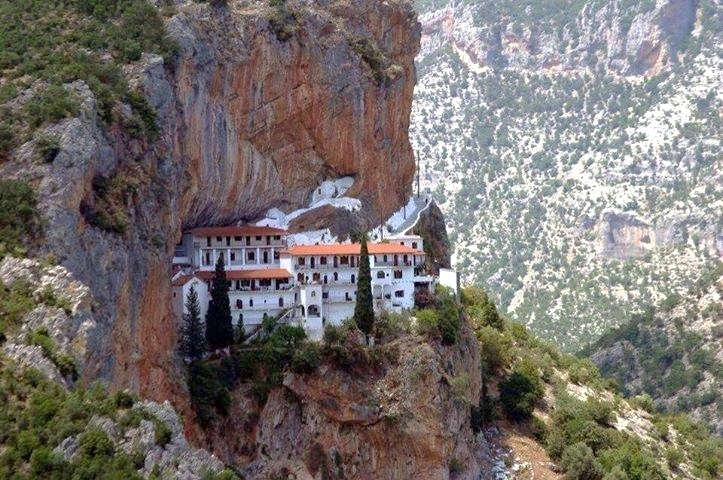 The monastery of Elona is one of the most picturesque and well-known one in Greece. It is located near Leonidio, 66.5 km from Paralio Astros and 107 km from Tripoli in the canyon of Dafnon. It is famous for its location, literally nestled on a vertical and impressive red rock, it excites the visitor giving the impression that it floats in the air. Its position offers magnificent view to the area. The monastery was founded at the beginning of the 16th century. The story says that some shepards saw a small light on the rock every night. Some people then climbed there and saw the icon of Virgin Mary holding the Holy infant hung on a piece of wood on the rock and a lit candle. The temple of the monastery was reconstructed on the ruins of the old former temple in 1809. The stone belfry was built in 1831. It is believed that the icon of Virgin Mary of Elona which is kept there, was painted by the apostole Lukas (one of the 70 icons he painted). It is considered miraculous by the pilgrims and it is entirely made by silver. In the temple there are holy relics and heirlooms, euagellies, a lot of dedications and a nice wooden carved partition. It is not known when it was madeand it is characterised by very subtle work and imagination. On its parapets there are carved illustrations. Around the temple there are well-built buildings. During the turkish occupation the monastery was plundered and burnt many times but it was of remarkable decay from 1798 to 1811. Late it was also under blooming with the contribution of the locals and of the residents of Spetses and Hydra especially after 1875 and 1900. It also had an important role during the Greek revolution in 1821. The monastery celebrates on the 15th of August and on the novena of Virgin Mary. A lot of pilgrims flee from whole Greece and especially from Peloponnese. It has been a female monastery since 1972.